* msdos should be flagged with boot and gpt should be flagged with msftdata. UEFI can only boot FAT32 drives! If you need to make an NTFS UEFI bootable flashdrive to remove the 4 GB maximum file size restriction of FAT32 see this: UEFI NTFS: Bootable Windows USB from Linux. This is the first step. GParted has a nice GUI and it is easy to use for this. So, plug in your USB flashdrive and start GParted (root permissions required). Select the USB drive and unmount it, otherwise you won't be able to format it. Warning! Selecting the wrong device will result in data loss! GParted main window. The first thing to do is select the USB drive. You must re-create the partition table by going to the Device menu then select Create Partition Table. Choose msdos (or gpt if you want an UEFI only bootable drive) and click Apply. 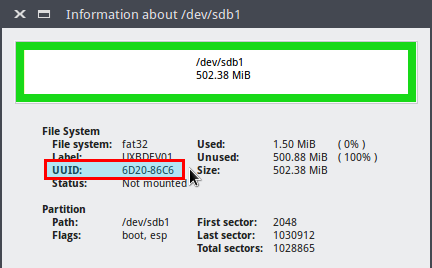 Right click the unallocated space and select New. Make a primary NTFS or FAT32 partition and give it a label too. The label must be as strange as possible because the bootloader will identify the bootable partition by this and you should not use windows like I did in the video! If the filesystem is FAT32 use only uppercase letters. 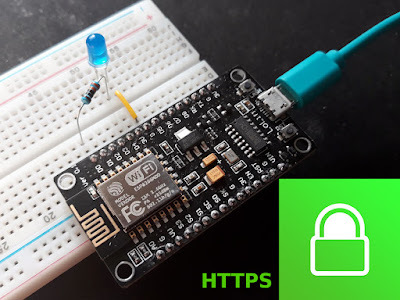 For example: WUSB1840 would be a good label (W for Windows, USB for USB flash drive and 18:40 is the time I was writing this). Remember the label as you will need it later. If you have a customized Windows with install.wim larger than 4 GB you should definitely go for NTFS. Otherwise, if you choose FAT32, you could get the flashdrive bootable from UEFI too. Apply all pending operation from Edit menu - Apply all operations or click the button on the main window. 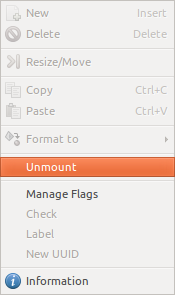 Right click the partition and choose Manage flags. If you chose the msdos partition table tick boot. If you chose the gpt partition table, msftdata should already be checked. Quit GParted and use the file manager to copy all files from Windows ISO to USB stick. Mount the ISO using Open with - Disk Image Mounter (if you use Nautilus as a file manager). If that fails you can use Furius ISO Mount and loop-mount the ISO. Select all files Ctrl+A and Copy to USB drive which will be automatically mounted when you click on it at /media/<username>/<drive_label>. After the copy process is finished, look in the USB root folder for the boot directory. If it is uppercase, rename it to lowercase. If you used NTFS filesystem and MSDOS table, only method A is available. If you used FAT32 and MSDOS table, you can apply method A, B or both. If you used GPT partition table, only method B should be followed. Warning! Selecting the wrong device (/dev/sdX) may result in bootloader corruption of the running operating system! Replace <USB_drive_label> with the label from step 1 (you can place it between quotes if it contains a space, although it is not recommended to use spaces in drive label). Save the file as grub.cfg and put it on the USB drive in the boot/grub folder. That's it. The USB drive is now bootable from BIOS and can be used to install Windows on your PC. The first time you boot from it in MBR BIOS or CSM mode select Start Windows Installation. Not all Windows versions are supported. Windows 7 on 64 bits, Windows 8 and newer versions should work. After the copy process is finished, look in the USB root folder for the efi/boot directory. If there's a bootx64.efi or bootia32.efi file there, then you're done. You can boot from your USB in UEFI mode. If the OS you are making a bootable USB for is Windows 7, browse the efi/microsoft folder and copy the entire boot folder from this path one level up in the efi folder. Merge folders if boot already exists. Here is what to do if you don't have the bootx64.efi file in efi/boot folder. Browse the mounted Windows ISO image into the sources folder. Open install.wim (or install.esd) with your archive manager (you will need 7z installed). Go to the path ./1/Windows/Boot/EFI and extract the file bootmgfw.efi anywhere you want. Rename it to bootx64.efi and put it on the USB drive, in the efi/boot folder. If you can't find bootmgfw.efi in install.wim then you probably have a 32 bit Windows ISO or other types of images (recovery disks, upgrade versions). You can now boot from your USB in UEFI mode. Install the grub-pc-bin package with sudo apt install grub-pc-bin and run the grub-install command again. If you get embedding errors (something like filesystem 'x' does not support embedding or Embedding is not possible), be sure you are installing GRUB to USB device and not USB partition. Most likely you typed /dev/sdb1 instead of /dev/sdb (sdb is just an example here). If it still doesn't work, try zeroing the USB drive (at least some sectors at beggining) or use a different USB flash drive. Sometimes, GRUB will not want to install on some flash drives. Try to force it by adding --force argument to the grub-install command. 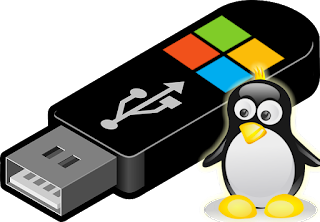 The root partition selection may fail if your USB flash drive partition has the same label as one of the partitions on the target computer. The best way of setting the root partition is by UUID. Launch again GParted and select the USB flashdrive. Right click the partition and select Information. Note the UUID field. where you will replace <drive_UUID> with the UUID you got from GParted. Still getting errors? If you want an useful answer, please post a comment with the complete grub-install command and the error message. Grub2/Installing. 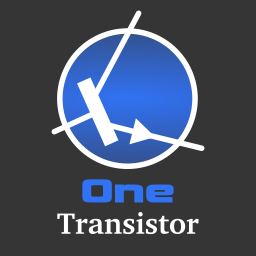 Ubuntu Documentation, Community Help Wiki. Amazing! I used Etcher and it didn't work, but with your steps it was extremely straightforward. Thanks! Thanks for your tutorial, after so many reattempts, finally got clear instructions. Great Tutorial! Thank You. For people who want to install Windows 7 on a PC that came with Windows 8 or 10 change the BIOS Settings to allow the installation of older Operating Systems. I'm getting two errors. /bootmgr not found and "You need to load the kernel first"
Grub can't find bootmgr in the root of the USB drive. Have you copied Windows files correctly? Grub doesn't offer the "target" and "boot-directory" options, the knoppix install only supports i386 though and has the option "root-directory"
The file /media/sdc1/boot/grub/stage1 not read correctly. I once tried this from a live Ubuntu. It gave me some errors too. I don't think this works from live medium. I followed the steps and got "Installing for i386-pc platform. Installation finished. No error reported." at the last step.But when I boot using the flash drive I get a grub command line instead of the "Start Windows Installation"
GRUB doesn't find the grub.cfg file or it has incorrect syntax. Check if the file is placed in the right folder and if its name is written correctly (some copied "grub.cfg " - with a space at the end - and had similar issues). I have tried this but still get the grub command line. The grub folder appears after you run grub-install. I followed all of the instructions and got no errors, but it just boots to a black screen and nothing happens. Bad ISO? Works like a charm. Thank you so much. Try with a different USB drive. I've tried the usual stuff with dd and cp, which works for every Linux and also worked with windows years ago. But now only this method seems to work, so many thanks! 1. Format your drive msdos and create a fat32 partition. your step 3 wasnt neccessary at all. May explain how formatting is done on demand though, though folding text e.g. i am trying to install win 10 on a legacy boot pc which only had windows 7 before . grub-install: warning: File system `ntfs' doesn't support embedding. "You are getting the warning because you are installing grub to a partition instead of the MBR. This means grub can not be embedded in the unused space between the MBR and the first partition." See https://unix.stackexchange.com/questions/174206/warning-file-system-ext2-doesnt-support-embedding-but-my-system-isnt-emb. For anyone who is having an error "install.wim file too large" you need to split the install.wim file in the sources folder from the disk image. For linux users, install wimtools and use wimsplit from the terminal. Probably, your USB drive is not bootable.